The Marine Mammal Center : Fruitvale: Sea Lion Takes a Wrong Turn onto a Freeway! Fruitvale: Sea Lion Takes a Wrong Turn onto a Freeway! Fruitvale, a young California sea lion, was rescued on a busy freeway in Oakland on June 22, 2009 by The Marine Mammal Center. Fruitvale, like hundreds of other sea lions rescued in 2009, was malnourished - the food he would instinctively forage for along the coast had simply disappeared. Sadly, many of these animals did not survive due to the medical conditions resulting from malnourishment. 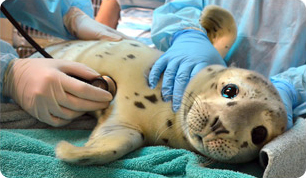 In 2009, the Center rescued more than 1,000 marine mammals of all species including more than 720 sea lions. Our yearly average number of rescues is about 600 animals, so 2009 was a very busy one for us and one where we have a lot of little mouths to feed! After almost a month of rehabilitation at the Center, Fruitvale was returned to the ocean. On Saturday, July 18, 2009, he along with five other rehabbed sea lions were loaded into carriers and onto the Kitty Kat for the 27 mile choppy journey out to the Farallon Islands. The Kitty Kat is operated by SF Bay Whale Watching which kindly allowed us some space on their boat to transport Fruitvale and his buddies Anquet, Hondo, Metheny, Prelude, and Superstar. Rescue volunteer Marjorie Boor (who picked up Fruitvale from Oakland Animal Control) as well as naturalists Trish Mirabella and Nicole Lee were on board to help with the release and answer questions from the guests who were pleasantly surprised that the whale watching trip they signed up for included a special stop to drop off some unique passengers.